For the second time in 16 years, a candidate has taken the presidency by winning the electoral vote, but not the popular vote. The Electoral College is enshrined in the U.S. Constitution. But critics have long said it’s an antiquated, even undemocratic system. At various points in history–including after the Gore-Bush election–there have been attempts to abolish the system. Bills to do that were introduced last week in the House and Senate. Few believe they will succeed. Defenders of the Electoral College say abolishing it would have a devastating effect on our constitutional form of government. Understanding the Electoral College-–and prospects for changing it. Jeffrey Rosen President and CEO, The National Constitution Center; author of "Louis D. Brandeis: American Prophet"
Gary L. Gregg Director, McConnell Center at the University of Louisville; author of "Securing Democracy: Why We Have an Electoral College"
MS. DIANE REHMThanks for joining us. I’m Diane Rehm. 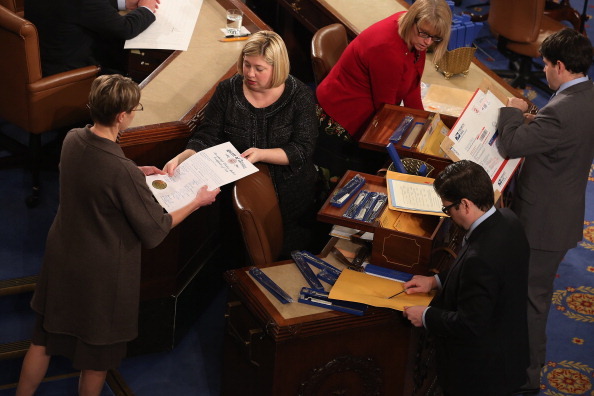 Legislation was introduced in Congress last week proposing to abolish the electoral college. Almost no one thinks that will happen, at least not any time in the foreseeable future. But Donald Trump's election victory, despite losing the popular vote, has lead to renewed debate about whether it's time to rethink the electoral college. MS. DIANE REHMHere in the studio to talk about how we elect the U.S. president and efforts to change the process, Jeffrey Rosen of the National Constitution Center and Rob Richie of Fair Vote. Joining us by phone from Kentucky, Gary L. Gregg of the McConnell Center of the University of Louisville. I invite you, as always, to be part of the program. Give us a call, 800-433-8850. Send an email to drshow@wamu.org. MS. DIANE REHMFollow us on Facebook or send us a tweet. Thank you all for being here. MR. JEFFREY ROSENThank you, Diane. MR. GARY L. GREGGThanks, Diane. REHMJeffrey Rosen, first, explain to us how and why the electoral college came into being. ROSENThe first thing to realize is that out of all the constitutional mechanisms they created, the founders thought the electoral college was the most perfect. Alexander Hamilton, who's the rap star of the moment, said in Federalist 68, the mode of appointment of the chief magistrate of the United States is almost the only part of the system which is escaped without severe censure. It unites in an eminent degree all the advantages the union of which was to be wished. ROSENSo what were they trying to achieve with the rather complicated structure? First, they wanted to give the president an independent base of support. There were some proposals to elect the presidency from Congress, but the fear was that he would be too dependent on Congress and there had to be some popular basis. They also wanted to give him popular legitimacy and the fact that the electoral college was chosen by the people or the state legislatures meant that he would have some popular basis. ROSENBut they rejected a proposal from James Wilson that would've actually had popular election of the president, which seems much more straightforward than the electoral college because they were concerned about demagogues. They were afraid that if you had popular election, then demagogues would arise, as they had in Rome and Greece, and they counted on the electoral college to block the election of the demagogues by choosing the most fit candidate. ROSENAnd finally, they wanted to channel the energies of major political figures who wanted to be president and insure that people who were elected had a proven record of service, rather than courting what Hamilton called the little arts of popularity. So it was a combination of popular support with a winnowing by wise men so that the best people would be elected and that was their hope. REHMAnd how are the electors themselves chosen in this day and age? ROSENUnder article II, each state gets the same number of electors as their congressional delegation. D.C. gets three electors. The Supreme Court held in an 1892 case that how to choose electors belongs exclusively to the states. Today, 48 states choose electors on a winner-take-all basis, two states, Maine and Nebraska, award the electors by congressional districts and give the remaining two electoral votes to a statewide winner. REHMAnd are electors bound to vote as they are instructed to vote by the state? ROSENSome states do bind their electors to vote. There have been a series of so-called faithless electors over the course of American history, 157 faithless electors who did not vote for their designated party's candidates, starting in 1796 with Samuel Miles, a federalist from Pennsylvania who got John Adams so upset that he said, what, do I choose Samuel Miles to determine for me whether John Adams or Thomas Jefferson shall be president? No. I choose him to act, not to think. ROSENBut as a result of the so-called faithless electors problem, 30 states and D.C. have enacted punishments for faithless electors, including fines and misdemeanors, but 21 states don't require their members to vote for the party's designated candidate. REHMRob Richie of Fair Vote, tell me how you feel about the electoral college. RICHIEWell, there's a couple aspects of it -- Jeffrey did a great job sort of summarizing the history. One thing we know is that that original motivation changed almost immediately, right? So it didn't work out the way that they thought it would, even within ten years. And so we've had a different setup and it's actually changed quite a bit over the years. But what we have now is, you know, these series of popular vote elections that take place in different states and we sort of box up the votes in each state and use generally, winner-take-all role. RICHIESo whoever wins the vote in each state gets all of the electoral votes. And the candidates react to that system in a way that I think is extremely destructive to the country. And the basic problem that's broken in every presidential election now is not the occasional fact of something that's on many people's minds right now, that the candidate with the most popular votes can lose, but that the candidates treat states so extremely differently so that this year there were 12 swing states that were widely recognized going into the election. RICHIEThe candidates spent 94 percent of their campaign events in those swing states. They spent more than half in only four large swing states. And here's a great stat, just to show how perverse things can get, is that the Clinton/Kaine ticket did almost a quarter of their post convention campaign events in one single state of Florida. And so most states get ignored, most of rural America gets ignored. Most small states get ignored. Most big states get ignored. Most of us get ignored. RICHIEAnd that really has ramifications on how they campaign, what they talk about, who they think matters, what they do as president when they're directing federal grants. It's just not equal and that's what the basis of America should be. REHMAnd Gary Gregg, you have written a book titled, "Security Democracy: Why We Have An Electoral College." Why do you think, in this day and age, it's important to have and keep an electoral college? GREGGYeah, well, first, I'll say Rob is largely right in the way he analyzes what happens with the electoral college. I think it's a good thing the way that develops and we can talk about that as we go. But I think, you know, the thing we have to keep in mind is that we have competing values in any kind of -- in a political system. And most of the opponents of the electoral college want to focus simply on democracy, that is the simple idea of one person, one vote across the country, add them up and that's what democracy should be. GREGGThe founders had an understanding, though, that simple answers are not always the best and are seldom the best in government. And so I think there are competing values that the electoral college helps support, including federalism, the rule of law and insuring really competitive elections like we had right now, which is really good for America. It insures a diversity of participation and representation across the country and stability. GREGGI think we need to keep all those in mind and talk about all those as we talk about the alternatives to a system like the electoral college. REHMWhy isn't one person, one vote useful anymore? GREGGWell, it's certainly useful and it's exactly how the electoral college works. We just add them up by state. And so this is just a mechanism of counting. We count by state. In the states, every single voter counts as every other single voter. It's democracy. It's just a way of counting that does have a profound impact, I think, on our political system. REHMAnd how are we ignoring most Americans? RICHIEWell, everyone had some motivations to vote and I'm glad that turnout was 58 percent. I'd like it to be higher, but you know, most people did vote, even in the states where the candidates and the campaigns didn't really care if they voted or not, right? I mean, they wanted them to, but they didn't lift a finger to make sure it happened. But that if we make every vote equal in every election, it means that there's reasons to participate. RICHIEThere's reasons to engage with people across the country, election after election. We know how popular vote elections work because we use them for everything else. So a lot of what we're going to hear in talking about this is if we don't really know popular elections work, but in fact, we do. That's how all of our governors win. And we can just focus on governors and, you know, are they generally more extreme than the country? Are they ignoring the small parts of their state? Are they doing, you know, are we fracturing into multiparty democracy in races for governor? RICHIEAnd we really aren't. And I think we can test how it works by sort of looking at how it's working and realize that that would be a good thing for the way we elect the president as well. REHMSo you believe that the electoral college is not longer as valuable as the founders thought it would be. RICHIEWell, here's a tricky way I'm going to be talking about it. There's proposals to abolish the electoral college. We'll, I gather, hear from members of Congress interested in that today. I'm very focused on a proposal that's a state-based proposal that keeps the electoral college, which if you think about it in the lens through the reformers using this model, it's called the National Popular Vote plan or the Interstate Compact To Achieve A National Popular Vote, but it's based on states acting in what we believe is their self interest to have a national popular vote for president where every vote in every state counts and to use the electors as a vehicle to achieve that objective. RICHIEAnd that's actually something that's passed in ten states and D.C. and it's thinking of the electoral college not as the current way we use it, but as a tool where we can achieve the kind of presidential elections we want. REHMRob Richie, he's executive director of Fair Vote. When we come back, we'll hear from you, your thoughts, your opinions. We'll also hear from Congressman Charles Rangel. He and Barbara Boxer have introduced bills to abolish the electoral college. REHMAnd welcome back. We're talking about the Electoral College. Many have said it's outdated. Others believe it is a good and fair way to elect a president. Someone asks whether -- or what the popular vote results were for the 2016 presidential election. Apparently there was about a two-million-vote margin in Hillary Clinton's favor. Here with me, Jeffrey Rosen, he's president and CEO of the National Constitution Center, and Rob Richie, executive director of FairVote. Gary Gregg is on the line with us and on Skype. He is a political scientist at McConnell Center at the University of Louisville and author of "Securing Democracy: Why We Have an Electoral College." REHMJeffrey Rosen, give me the pros and cons of electing a president by virtue of the Electoral College. ROSENWonderful. This is my favorite National Constitution Center mode, to give the arguments on both sides. So the pros, and we've heard these from Gary, as well, it preserves state-based federalism and preserves the states as distinct units. It guarantees the president will have national support that's geographically dispersed. It reduces sectionalism and reinforces minority rights. ROSENThe U.S. isn't supposed to be a pure democracy. We rejected that at the time of the founding, and we want checks on popular passions, and overall, it hasn't been so bad. It's had 92 percent of non-controversial results. The cons, it consigns most states to spectator status and drags down voter turnout in those states and reduces the real field of play to less than a dozen swing states. It polarizes our politics while reducing voter turnout. It increases the likelihood of strategic mischief and corruption. A close election can result in no Electoral College majority, leading the election to go into the House. And electors aren't required to follow the popular vote. ROSENBroadly as I hear those arguments on both sides, I think the strongest ones in favor are at least we have a clear winner unlike, you know, the popular vote is still being counted, but the electoral votes are clear sooner. And it does maintain some sort of identity for the states. The obvious one against it is that America is supposed to vest sovereignty in we the people, and if the people's will were repeatedly thwarted, this is the fifth time now in American history, that is a challenge to the popular sovereignty on which our Constitution is based. REHMSo Rob Richie, explain a little more how your group would like to see this electoral process change. RICHIEThanks, Diane. Let me first say -- give out a website where the group that we work with that leads the lobbying efforts is called National Popular Vote, and their website is nationalpopularvote.com. They lay out the plan. There's a book I helped write called "Every Vote Equal" that tries to go through every piece of the plan and answers lots of questions that people might have about it. RICHIESo here's the gist of it, which is that the goal for reformers who believe that the president should be elected the way we elect governors and everything else is to have the popular vote in all 50 states and D.C. determine who wins. So that's what this plan achieves. The mechanism is to -- is grounded in the way that the Constitution gives two powers to states. One is they can enter into agreements with other states, they're called interstate compacts, and we have many of them, hundreds of them, and this is a way to sort of bind decisions together, and then you're in a contractual relationship to stay with it. RICHIEThe second is that they control how to allocate their electors, as Jeffrey said, two states don't do it popular vote statewide, they do it congressional district. Over our history, we've had many different systems that have been done by states. And so it keeps federalism that way in that the decision is being made by the states. But the decision that they're making is to say we want to give all of our electoral votes not to the winner of the statewide popular vote but the winner of the national popular vote in all 50 states and D.C., we want it to be decisive, so we're entering an agreement to do this once it becomes decisive, which means the number of electors in the participating states has to represent a majority of all the Electoral College, which means right now 270 or more. RICHIESo it's passed in 10 states and D.C. They collectively have 165 electoral votes. That's not enough to change anything, so nothing changed for this election. But once it hits that mark, and probably goes beyond it, then in the next election, the national popular vote winner will govern the election. REHMWhat do you think about that, Gary Gregg? GREGGWell first, I think it's -- I'll say a kind of fraud because it is a way of -- what Rob has realized and his group realized is that they have not been able to amend the Constitution the way the Constitution says it needs to be amended, and that is Article V of the Constitution. They have fought this, they have tried this, they have failed at this. I understand that. And they've gotten frustrated. And now they've found a mechanism they think they can get around the Constitution to amend it. So I think that's -- that's really not what we should be doing in this country. GREGGSecondly, if you ask Rob what are all the states that have passed them, they are all the deepest, bluest states in the country, which makes me a little suspicious that there may be a little political thing going on, too, and that is these deepest blue states, like California and Maryland and New York, want to elect a Democratic president. And so I think this is probably not going to go because eventually they're going to have to get deeper and try to get some red states, and I don't think red states are going to buy into this. GREGGAnd it also -- it undermines, you know, all that -- Jeff did a good job of outlining the positive of -- we argue of the Electoral College. The one he didn't say was that I think it also supports the rule of law, and that is it supports a -- it supports clear winners that are given by the electors, and that keep us from having, in very close elections, national recounts. GREGGI mean, you imagine going into this race, we were 150,000 votes in the first few days. Now it's widened, Hillary Clinton's victory is widening in the popular vote. There's 150,000, and we had a presidential candidate who already was claiming the system is rigged. In a close election like that, if all you have to get is one more vote than the other person, do you think we are not going to spend $100 million, $200 million, $500 million to try to recount in every state, in every precinct, in every county across the country? GREGGI think the 2000 election of Gore v. -- Bush v. Gore and all that, that really turned a lot of people who were against the Electoral College I think in favor of it because it funneled our fight into one state and saved us a national nightmare. REHMJeffrey Rosen, how many times has the popular vote winner in our presidential elections not been the electoral vote winner? ROSENIt has happened five times now. The first time was 1824, which was quite a drama, where the winner of the popular vote, Andrew Jackson, was -- lost, and John Quincy Adams was elected instead. The second time was 1876, which was so amazing because it was such a dramatic prefiguration of 2000. Once again the election came down to battling ballots from the state of Florida. Congress created this Electoral Commission, and the tie-breaking vote was cast by a Supreme Court justice, who was visited by the Senate majority leader, who prayed in his dressing gown, and he was persuaded to vote for the Republican Hayes over the Democratic candidate Tilden. ROSENAfter that, Congress passed a law saying keep the Supreme Court out of it, but nevertheless that didn't happen. 1888 is the next time. Grover Cleveland runs against Benjamin Harrison. Cleveland wins the popular vote, but Harrison wins the Electoral College, but Cleveland has his revenge by the next term, coming back for his next time, the only non-consecutive president. And then of course we all remember, those of us who are old enough to be here, of the disputed election of 2000, where Al Gore gets over 500,000 more votes than George W. Bush but lost -- loses in the Electoral College by 266 to 271. So this is the fifth time that that's happened. REHMSo the idea, as you outlined it in the beginning, was to keep a demagogue from becoming president. Is that idea moot at this point? ROSENI think it is moot because we now expect electors not to cast independent judgment but essentially just to follow the wishes of their people. And arguably it was mooted very early on. The founders expected that often candidates would fail to get an Electoral College majority, and the election would be thrown into the House, and their representatives, who they expected also would be wise Solons who exercised independent judgment, would pick the best men, who were least likely to be demagogic. That just went out the window right at the very beginning with the election of 1800 and because of the complicated system of the original Constitution, where there was a tie between Thomas Jefferson and his own Vice President Aaron Burr. ROSENWe know, those of us who have been lucky enough to hear the musical "Hamilton," that because partly of Hamilton's intervention the House ultimately voted for Jefferson over Burr, leading to the 12th Amendment, which said that basically the -- you have to have separate votes for the president and for the vice president. ROSENBut I think it's fair to say even defenders of the Electoral College would claim that it's not exercising that anti-demagogic function but is just counting popular votes in a different way. REHMRob Richie, do you believe that across the country there is a political will to change or to abolish the Electoral College? RICHIEThere has been consistent support for doing that in polls. Let me just address one thing that Gary mentioned about sort of the seeming partisan nature of what's happened with National Popular Vote and I think challenging that assumption. So for instance this year the National Popular Vote Plan passed the Arizona House with a Republican leadership. It was introduced in the Georgia State Senate with 55 out of 61 state senators sponsoring it. It also passed the New York State Senate, which is run by Republicans almost unanimously, both parties coming together behind it. RICHIEYes the 2000 election created a certain partisan analysis. This election, I think sadly, may create a certain kind of partisan analysis. I think those analyses are faulty. If you look at actually the last three presidential elections, in '04, '08 and 2012, and you project what would have happened if the Republican candidate had won by about a half-million votes, the Democrats actually probably would have won in the Electoral College. There's no intrinsic advantage for one party or the other. RICHIEWe also see popular vote elections for governor and Republicans win in big states like New York and Pennsylvania and Ohio. And, you know, it's -- we know that both parties can win, and they can win in a national election, as well. I think that the public consistently does want change, and ultimately I think we are going to get there. REHMGary Gregg, what do you think? GREGGYeah, I think it's really great to have these conversations. I think they are -- they are very important. I think the -- the system is still set up in such a way that -- and I think this election shows it, that there's -- most of the country will not, at the end of the day, want to change the Electoral College because they'll know they will be making themselves essentially irrelevant. GREGGI mean, if you look at -- just look at this election across the state, and we -- across the country. Those 12 states or so that were really seriously fought over, I understand some states like California were largely ignored, but those 12 ended up voting a lot like the whole rest of the country did. I mean, it was a good microcosm. GREGGOn the other hand, if you look at -- let's take these numbers here, Iowa, Ohio, Pennsylvania, Wisconsin, Florida, North Carolina, Colorado, New Mexico and Arizona, and you add up the vote differentials in all of those states between Clinton and Trump, they are less -- that vote differential is less than Hillary Clinton won simply in the city of Los Angeles. That's pretty remarkable. So she won 1.1 million more votes in Los Angeles, which means that Trump won most of the rest of the country, and now it looks like he's not going to because of the new votes coming in. GREGGBut I think what the Electoral College gets us is it gets us fights in the big cities that matter, yes, and in the rural America that matters, in the small states and the large states. REHMAnd you're listening to the Diane Rehm Show. I want to invite our listeners, as always, to be part of the program. Let's open the phones, go first to John in Birmingham, Alabama. You're on the air. JOHNGood morning, Diane, and to your guests. I want to say first of all, Donald Trump, if he's shown us anything, it's that there are no more rules. And I am sick and tired of living in a state that's so red that every time I vote for president it immediately goes to the Republican. I believe it's time for one person, one vote. RICHIEWell, Alabama is one of those majority states that actually have not been campaigned in actively in the general election since at least 2000. We have about 34 states, I think, which haven't received a single campaign event since -- for the last four, at least. And they don't poll there. They don't do anything to earn their votes. And I'm glad the caller participates. Most -- you know, most people in those states do, but there -- that's -- but the way they do is not -- it doesn't matter to the candidates. RICHIEI think there's another part of this, as well. I just want to be very clear that we did not have a popular vote election this year. So we don't know who would've won a popular vote election. In fact Donald Trump said I think I would've won a popular vote election, and he might have, right. I think that we -- we can't make any partisan assumption. But we can say that vote in Alabama would've counted the same as someone in Florida. REHMNow the question becomes, are people not voting because they recognize that their vote doesn't count? We had only, as you said, 58 percent of the voting population out this time, if that much. I thought it was like 55 percent. But that is what bothers me the most, that there is so few -- and 19 percent of millennials actually voted. What a shame. RICHIEAbsolutely a shame, and the stats are -- we're still getting the final votes in. That's why those voter turnout numbers keep getting adjusted, because we're getting the votes coming in. But we do know that the gap between the participation in the swing states and the rest of the country was about eight or nine percent. RICHIEWe also know that if you look at, say, millennial participation, the gap becomes much bigger because they're sort of new voters, new potential voters, and when they're not mobilized, they're just that much less likely to vote. That gap can be sometimes as big as, like, the difference between about 45 percent and 60 percent. REHMSo you believe that if there were no Electoral College you would have an increase in voter turnout? RICHIEYou would have incentives to have people participate election after election. Everyone would know that. There would be no dead zones, like Kentucky is a dead zone and like -- and like Alabama and so on, with both parties having a great incentive to have -- to work with their state parties and work with their allies in every country and every state and try to get people to participate not just in that election but thinking ahead to the next one, as well. REHMDo you believe that that could be true, Jeffrey Rosen? ROSENIt makes sense that if people did not think that they lived in a dead zone, and their vote did not count, that they would be more likely to participate. REHMAll right, we'll take a short break here. When we come back, more of your calls, your comments, and I look forward to speaking with you. REHMWelcome back. Joining us now, by phone, Democratic Congressman Charles Rangel of New York. Good morning to you, sir. CONGRESSMAN CHARLES RANGELDiane, you leaving makes it easy for me to leave the Congress. I admire your work so much, but I hope you, like me, will continue to be involved. REHMIndeed. I will, sir. I'm going to be doing a weekly podcast. So, now, let's get to the issue at hand. Last week, you introduced a bill in the US House of Representatives to abolish the Electoral College. I know that Barbara Boxer introduced a bill on the Senate side. Tell us why you think the Electoral College should be abolished. RANGELDiane, there are so many reasons, but I'll start, first of all, any Constitutional provision that most Americans have no idea that it exists or why it exists in the first place. At the very least, it should be examined. Second, there's no such thing as a Presidential-elect. We don't have a President and will not, Constitutionally, have a President until a group of people based on the members of Congress and the House and Senate come together and on their own, select somebody, notwithstanding, the popular vote. RANGELThe reason why the framers of the Constitution did this no longer exist. They were so afraid, and it's ironic, that someone would demagogue and be able to get the popular vote and not to have a respectable group of people they named the Electoral College, to be able to come in and do what's best for the country. And not what's best for the demagogue who managed to persuade people based on emotion rather than what's good for the country. We had 13 states, and even today, 28 of our states mandate that this so-called independent group follow the popularity vote as to what we have. RANGELAnd isn't it ironic where we now have a President that has threatened to jail his opponent, condemn the press, indicated that he would tell Generals to violate the laws relates to torture. Emphasize violence during the campaign, say that he's going to abolish international treaties. If there was ever an opportunity for an independent group to exercise this power, it would be now. RANGELBut the Electoral College, what happens is, when the candidates know that large states like Texas and New York and California because of a lot of reasons are going to vote Democrat or Republican, what do they do? They concentrate on smaller states for Electoral College votes to win the Electoral College votes. For all of those reasons and many, many more, the Congress should review, educate the public as to why we don't need this. And the reasons we should be afraid of a popular vote no longer exist. REHMAll right, and if Donald Trump had not been elected, or will be elected December 19th by those who are voting in the Electoral College, would you and Barbara Boxer be raising this now? RANGELI can't speak for Barbara Boxer, but there's no question that no matter who would have won this -- as a matter of fact, it would be a bigger case that the (unintelligible) Electoral College vote if it had served the purpose that the founders of the father wanted. Donald Trump would not be selected by this independent body. REHMSo, what do you think of the current online petitions trying to pressure electors to not vote for Donald Trump? RANGELWell, I don't know how big that movement is, because so many states mandate that the independence that the writers of the Constitution gave to these people to select a candidate based on merit rather than emotion and to avoid demagogues -- they're mandated by law to vote. Secondly, I kind of think it's too late to build this head of steam and it would cause more division because most people have no clue as to what the Electoral College vote is all about. Especially since it's not even taught in our schools adequately. RANGELBut I said this long before the outcome, that we have to review the intent the writers of the Constitution and we can't allow people, and I haven't, in New York, I haven't been able to get your show, but I'll take a gamble that most the people -- maybe not the intellectual group that calls into you, but most Americans believe the election's over. They don't know, as you just quoted, we don't have any President. And we will not have a President until this small group of people come together and elect that President. RANGELFor that reason and that reason alone, the Congress should review and have an amendment which would take two thirds of the Congress and three fourths of the state. REHMAnd on that very point, I wonder if you see your bill and that of Senator Boxer's as mostly symbolic. Especially given the Republican control of both Houses of Congress. RANGELLet me make it perfectly clear. I think that symbolic legislation is a part of what our Constitution is all about. I don't expect that the Congress is going to react to this, but you can bet your life that Senator Boxer and I will have more than enough reason, with President-elect, they call him, but with the next President, to review this Constitutional provision. It's an educational factor. It's a reason for people to see whether or not we should have a protection for smaller states. RANGELWe should have to find out why is it, when the campaign begins, candidates concentrate on what they call battleground states instead of the other states. Why is it they just take for granted certain states in the Electoral College votes? And if the reason is to avoid have people that have demonstrated what the President-elect has said during the campaign. Clearly, the Electoral College does not meet the purpose that the Constitution writers wanted. RANGELBecause he has -- he has said during the campaign he was going to deport people, he was going to jail Hillary Clinton, that he was going to ban the press. He advocated violence. He was going to dictate to the military what torture is going to be. He was going to break up international treaties. These things happen in countries that are not democracies. RANGELThis is what they were trying to avoid in allowing -- saying, if indeed someone has these bad qualities, and is able to persuade the American people through bias and prejudice to win, then it would be the keeper of the principles of a President to come together and independently and reject that and do what's best for the country. RANGELClearly, that intent does not exist today, and if there's no other reason, Diane, is to say why do we have the Electoral College in the first place? Why do we have it today? REHMCongressman Charles Rangel, Democratic Congressman representing the 13th District of New York. He is currently the second longest serving member in the US Congress. Congressman Rangel, thank you so much for joining us today. RANGELYou've been a joy to talk with. REHMThank you. And back to you, Gary Gregg. It's your turn to comment on the Congressman's comments. GREGGThanks, Diane. I think, you know, the Electoral College does not function, as Jeffrey said in the beginning, as the founders intended. On the other hand, and so all of that discussion of the demagogue is not really relevant anymore. It is democratic. It's just the way we count by states. But I do think there's an element of anti-demagogic sort of element that we could talk about. And that is it does force candidates, you know, if you think about the populations, those battleground states, we were fighting in Pittsburgh, in Detroit. GREGGBut also Annandale, Michigan and rural Ohio and Cincinnati and Cleveland and North Carolina. And we were fighting in those states, and there's some element that keeps a demagogue from rising in the sense that you've got to balance, in some degree, your, your campaign here. Where if you could just sit down into a few major cities, let's say, or sit down just into blue states, let's say. Or just into rural areas. Because, you know, you fear turning off those other voters. You could really become quite demagogic. GREGGAnd there's an element that, you know, our whole system is set up based on Electoral College in the sense that we have a two party system. Daniel Patrick Moynihan was the guy who really convinced me of this. A Senator from New York, is that we're naturally a four party country. Maybe a five party country, but because the Electoral College, we force our candidates, our parties into two broad parties and so we keep the Ted Cruzes on the right out and the Bernie Sanders on the left out. And we get somebody, this year's a little bit different with Trump. GREGGBecause nobody knows where he really is. But we had two fairly moderate, one left and one right, that can fight across this country and it's because we have the Electoral College that gives all of its votes. You have to win the entire state to get all the votes. And again, Moynihan pioneered that argument. I think it's a pretty good one. REHMAll right. I'm going to go back to the phones to East Lansing, Michigan. Hi Bob, you're on the air. BOBHi Diane. I'm a student at Michigan State University. I'm a Constitutional Democracy major. And last week, I was at a conference where we were talking about different ways to amend the Electoral College. And specifically with that, we don't necessarily just have a direct popular vote as the only other option. ROSENGreat question. So, you're saying that a direct popular vote is not the only other option. There are different ways to amend the Electoral College and we've talked about some of them. But it's also worth noting that there are different ways to amend the Constitution aside from having two thirds of Congress propose it. We've all -- all three of us agree that this Congress is unlikely to propose the amendment. But there is another method. You can have states calling on Congress to propose an amendment. ROSEN27 states have called for a Constitutional Convention on a balanced budget amendment. Just seven more states have to act to have a Constitutional Convention. And if a convention were called, which is not a theoretical possibility here, it would, in theory, be free to consider amendments in addition to those for which it was called. Making the possibility of an Electoral College amendment, at least, on the table. So I think, it's great that you're studying Constitutional history. This is a time of Constitutional debate and the possibility of a Constitutional Convention is not completely off the table. REHMAnd Bob went on to say that the most interesting idea was assigning some electoral votes to the winner of the popular vote. What do you think about that, Rob? RICHIEWell, that's one proposal is a sort of an add-on. It would still take a Constitutional change, but they would, sort of, keep the state results and then give like a 100 electoral vote bonus, which of course, would pretty much always mean a popular vote win. There's other changes as well. I think the most simple one is just the one with the most votes wins. REHMAnd you're listening to The Diane Rehm Show. And let's go to Craig in Friendswood, Texas. Hi, you're on the air. CRAIGHi, Diane. It's a pleasure to talk to you. CRAIGMy comment is -- well, I had a couple comments. But the first one is that the Electoral College isn't working today anywhere close to what the founding fathers wanted. Because originally, the number of Congressmen would keep increasing for every 30,000 votes. So if they had done that, instead of freezing the number of Congressmen, California would have like 1200 electoral votes and Wyoming would have 22. Which would make a much more balanced election. Because right now, it's skewed. A vote in Wyoming is worth over three times a vote in California. REHMWhat do you think, Jeffrey? ROSENThe original first amendment in the Bill of Rights said that there should be one Congressperson for every 30,000 inhabitants. That would mean there would be 4,000 people in Congress today. We have, at the National Constitution Center in Philadelphia, one of the 12 original copies of the Bill of Rights. And you can see that First Amendment, which is not the one involving freedom of speech, but one involving apportionment. So, it's clear that this is what the founders were focused on. ROSENHow many representatives should you have and how should the people be represented? ROSENAbsolutely. It was all based on population. They had -- they didn't imagine as many people developing as we have, but they were very concerned that their representatives not get too far away from the people at the House level. At the same time, they were also concerned about demagogues and wanted to have filter for popular passions when it came to the Presidential level. So the truth is, as we've talked about today, their conception and ours look quite different. RICHIEI'll just add briefly that they did not specify any method of election for the House of Representatives or for President. They really wanted to have states do this. They, they wanted to look at evidence and change over time. They did that during their lifetime with many changes. And I think that we -- it's wrong to equate the Electoral College with the current rules that states have. That's not accurate, and that also, it's wrong to think that the founders knew exactly how to do it. They, in fact, wanted us to be open to evidence and changing with the times, and I think that the evidence today is pretty strong for change. REHMYou're saying that they wanted us to be flexible depending on how the country changed. RICHIEExactly. And they built that into the Constitution. They did not -- like many state Constitutions and many international Constitutions, specify electoral systems and, you know, you have to use single member districts for the Congress or X, Y, Z. They don't do that and they really wanted us to be ready to change things. And in fact, they did that during their lifetime. GREGGYeah, and we have changed. We have democratized. And it is a democratic system now, unlike what they intended. REHMSo, you believe it should stay, it will stay exactly as it is, Gary. GREGGI think so. If you want to make -- if you wanted me to have one change we could make, and that is we could abolish the role of electors so we don't have to have that second election that Charlie Rangel was talking about. Just make it automatic, and you would keep all the benefits that I think are still there. REHMDo you expect any faithless electors? REHMWell, it's only a fine, isn't it? RICHIE...right. In fact, one Democratic elector said he'll pay the fine and vote for Bernie Sanders in Washington. It's an accident waiting to happen. REHMInteresting. Rob Richie of FairVote. Jeffrey Rosen of the National Constitution Center. And Gary Gregg. He's the author of "Securing Democracy: Why We Have an Electoral College." Thank you all so much.